Sciatica refers to pain that radiates along the path of the sciatic nerve, which branches from the nerves in your lower back through your hips and buttocks and travels down each leg. Typically, sciatica only affects one side of your body. Sciatica is a symptom defined as unilateral, well-localised leg pain with a sharp, shooting or burning quality that approximates to the dermatomal distribution of the sciatic nerve down the posterior lateral aspect of the leg, and normally radiates to the foot or ankle. Several studies have suggested that in general an estimated 5%-10% of patients with low back pain have sciatica, whereas the reported lifetime prevalence of low back pain ranges from 49% to 70%. Some studies have suggested that sciatica becomes more prevalent in individuals who are over the age of 30 years old, which may suggest a prolonged ‘wear and tear’ effect on the body. The signs and symptoms of sciatica can be seen in a wide range of individuals, from sporting athletes to office workers and people who perform manual labour on a daily basis. The sciatic nerve is the largest single nerve in the body, comprising of many individual nerves roots branching from the lower back (L4 – S3) to the feet. When affected by a spine-related medical condition, Sciatica symptoms are commonly located in the lower region of the body. Factors such as age, obesity, occupation, prolonged sitting, and diabetes are the most common risk factors cited in the scientific literature. It only makes sense that the ageing process can cause a ‘wear and tear’ effect on the structures of the lower back. 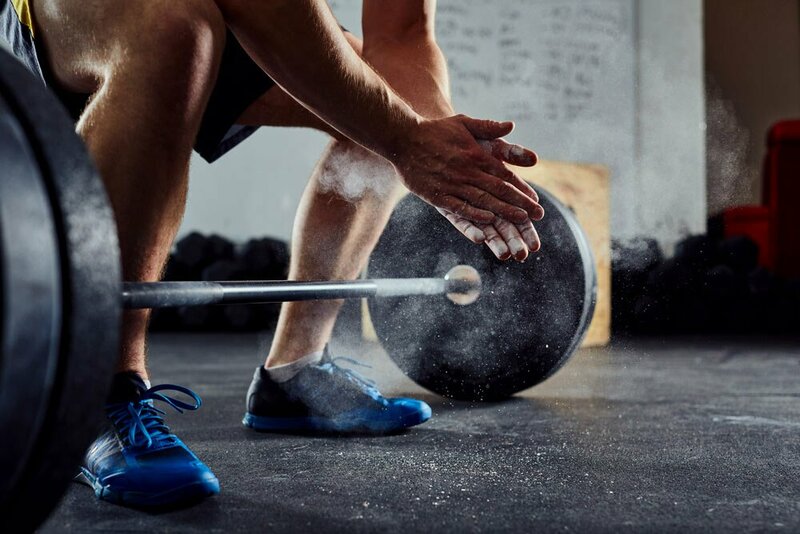 Likewise, chronic stress on the spinal column from prolonged sitting, heavy lifting, and repetitive actions can create an accumulation of stress and strain that eventually leads to degeneration or injury. Accumulation of stress and strain through various lifestyle factors. This may include poor sleeping patterns, prolonged psycho-emotional stress from work, home life, relationships or financial challenges, and chronic overload from training or sport. There are many causes of Sciatica that have been discussed in the scientific literature. These causes and their associated symptoms are discussed below. DDD (Lumbar Degenerative Disc Disease) Commonly associated with ageing but can also be seen among people in their 20’s. DDD is the wear and tear of the intervertebral discs which act as padding for our backs aiding flexibility and movement. Young people are affected by this through injury, genetic factors, and the lifestyle factors discussed above. Symptoms: Lower back pain, numbness, tingling and pain around the lower body. Lumbar Spinal Stenosis is the compression of the lumbar vertebra caused by the narrowing of the spinal canal. Symptoms: Lower back pain, numbness through the lower body and/or loss of bowel and bladder control. Lumbar Herniated Disc occurs when the gel-like nucleus of the disc leaks out the back of the disc and puts pressure on the exiting nerve roots. Lumbar herniated discs are correlated strongly with DDD and may be caused by ageing and general wear and tear. Symptoms: Numbness of the lower back, pins, and needles. Muscle spasms, neck stiffness, and pain in the arms, back, legs or feet. Isthmic Spondylolisthesis is when a vertebra slips forward caused by a fracture in the vertebrae. In turn, this shift of the vertebrae may compromise one or more of the exiting nerve roots. Pregnancy can cause a lot of compression in the body especially in the back. Carrying the weight of the baby can induce wear and tear to the lumber discs resulting in Sciatica-like conditions. Symptoms: Lower back and hip pains. Spinal Tumor can be a growth which develops in or near the spinal cord. This can be malignant (cancerous) or benign (non-cancerous) in nature. Pain in the lower body (rear, leg, and the hamstrings) that is worse when seated, hot pain in the buttock. Experiencing difficulty, numbness, and weakness moving the leg or foot along with constant acute pain on one side of the buttocks. Isolated pain that makes it hard to stand up along with burning or tingling down the leg. Piriformis Syndrome is a neuromuscular disorder that is caused when the piriformis muscle compresses the sciatic nerve. The piriformis muscle is a flat, band-like muscle located in the buttocks near the top of the hip joint. Symptoms: Usually starts with pain, tingling, or numbness in the buttocks. 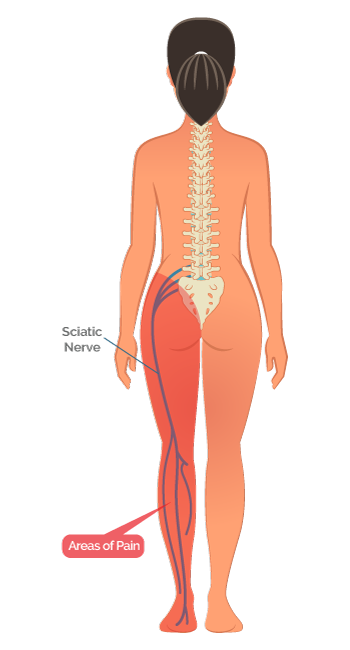 Pain can be severe and extend down the length of the sciatic nerve. The pain is due to the piriformis muscle compressing the sciatic nerve. It should be noted that the vast majority of patients who are experiencing lower back pain and/or symptoms down their legs, can find complete relief from non-surgical options. The first and most important step in the process is to seek the advice of a holistic ‘Pain and Dysfunction’ practitioner. 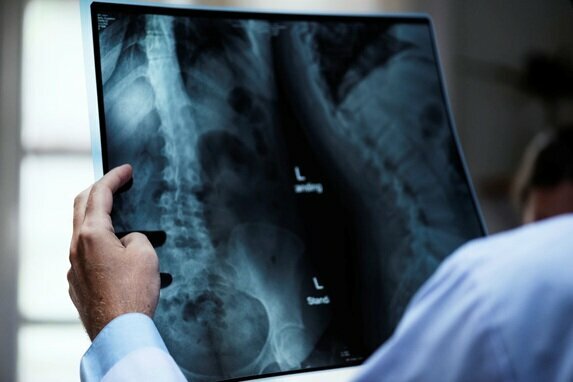 Far too many patients head down the path of radiological imaging, medications, injections and surgery before exploring less invasive therapies that have been proven successful. The ‘Pain and Dysfunction’ practitioners at the Body Genius Institute have a combined 30+ years of clinical practice (50, 000+ hours) and have literally helped many hundreds of people overcome sciatica and sciatic-like symptoms. One their unique assessment and treatment skills is called ‘Neuro Dynamic Testing’ (NDT) and gives our practitioners a clear understanding of how well your nervous system is functioning. This is a critical step in both assessing and treating sciatica and sciatic-like conditions. This assessment process is non-invasive, completely pain-free and takes less than ten minutes to perform. In the vast majority of patients, their nervous system can be cleared in less than 30-minutes of treatment providing them with significant relief from their condition. Even more importantly, NDT can be used a diagnostic tool as well. In other words, if treatment is not successful in clearing the patient’s nervous system, then radiological imaging in the form of an MRI scan may be warranted to consider structural challenges (herniated discs, osteophytes) that may be compromising or impeding upon the flow of the sciatic nerve. A non-invasive, pain-free test and treatment can determine your need for radiological imaging. The good news is that in greater than 95% of cases the patient’s nervous system can be cleared through NDT and treatment. If diagnosed with Sciatica, it is vital to adopt healthy habits for pain relief and to make it easier on your body. Relative rest from offending activities such as work, sport, and training. Stop all inflammatory foods and drinks such as sugar, processed foods, alcohol, caffeine and all beverage other than water. Hydrate your body with 3+ litres of purified water per day. Find positions that are comfortable and change positions frequently. Consider healing foods such as ginger and turmeric which have anti-inflammatory and healing properties. Curcumin is a potent supplement which can be used safely and effectively for this type of condition. (If you’re pregnant, breast-feeding, using prescribed medications, or suffering from medical conditions then seek the advice of a qualified health professional prior to use). Applying heat to the lower back can often provide much needed relief. Get into a comfortable position and then practice deep breathing exercises. Don’t wait to seek the advice of a ‘Pain and Dysfunction’ practitioner. If symptoms have not resolved significantly within 24 hours then schedule an appointment immediately. The longer you wait, the more challenging it becomes to overcome this type of condition. Prevention can be more effective than cure and Sciatica is no exception. Sciatica is caused mainly due to general wear and tear of the body. Maintaining good sitting posture, practicing good body mechanics and regular exercise are advised to ensure the longevity of your entire spinal column and the associated structures such as nerve roots. DON’T WAIT FOR STRESS AND STRAIN TO ACCUMULATE WITHIN YOUR BODY! It’s inevitable that stress and strain will accumulate within your body over time due to the demands of the average lifestyle. When stress and strain accumulates in the body, there is a corresponding reduction or loss in your range of movement. The challenge is that this loss of movement is often so gradual that you do not notice it is occurring. One day you simply wake up and realize that you can no longer touch your toes, sit in a squatted position, sit cross-legged on the floor, or look over your shoulder when reversing the car. What is unique about the human body is that when the range of movement around joints decreases by more than 20% the brain perceives this as a threat and sends out ‘warning signals’ in the form of pain or other unwanted symptoms. And yes, this could be in the form of sciatic-like symptoms. Want to prevent sciatica-like symptoms and other pain patterns? Get in to see your ‘Pain and Dysfunction’ practitioner on a regular basis for a ‘tune-up’. A skilled practitioner can perform a head-to-toe analysis of your body and quickly identify to what extent you have lost movement in various joints around your body. This gives them a clear understanding of the extent to which stress and strain have accumulated within your body. And the best part is that they can clear this stress and strain and restore your movement patterns BEFORE pain and other unwanted symptoms occur. The honest answer is that if you are experiencing lower back pain and/or leg pain that does not resolve within 48 hours through healthy lifestyle choices, then you need to consult with a skilled holistic practitioner. COVERING UP PAIN WITH MEDICATION IS NOT A VIABLE SOLUTION! Your brain has created the pain in your body for a reason. It’s a strong message that stress and strain has accumulated to a level that can no longer be sustained or coped with. Ignoring this message will only lead to a greater accumulation of stress and strain and likely prove more challenging to clear. Don’t wait. Take immediate action. The truth is that Sciatica and sciatic-like pain can be very difficult to diagnose accurately and equally challenging to treat successfully. It is essential that you consult with a holistic ‘Pain and Dysfunction’ practitioner that has extensive experience in diagnosing and treating this condition. The Body Genius practitioners are able to help the vast majority of patients overcome their sciatic-like symptoms quickly. 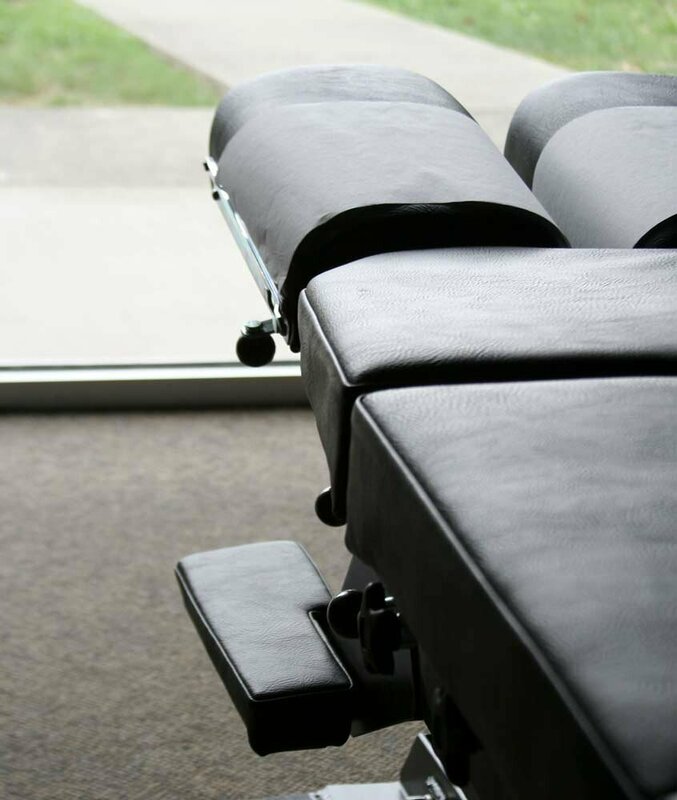 The Body Genius Institute is located just minutes from Perth’s CBD. All of our physiotherapists and pain & dysfunction practitioners are based at our Perth office, so you can get the physiotherapy care you need in one convenient location.